St. Louis, MO, Sept. 12, 2018 – Students returning to historic Corbin Hall at the University of Kansas - Lawrence (KU) for the fall semester stepped into a newly renovated, modern space complete with upgraded mechanical systems, a new main entry and upgrades to all student rooms, restrooms and public spaces. St. Louis-based KWK Architects was tasked with designing the $13.5 million interior renovation, which required that the historic hall for women remain closed for the 2017-2018 school year. “KU Student Housing is extremely pleased with the renovation of our historic Corbin Hall. The work of the entire KWK team allowed for a very successful and on-time project completion. The building was filled to capacity at move-in. Students and past residents of Corbin – many of them now mothers of current Corbin residents – have praised the updates that both renewed Corbin and honored its rich tradition at KU,” said Sarah Waters, KU Director of Student Housing. The original Corbin Hall, completed in 1923 at a cost of $156,558, was designed to accommodate 107 students plus a house manager and social director, with six stories on the east side and four stories on the west side. Developed specifically to meet the housing needs of undergraduate women, Corbin became KU's first dormitory. A north addition was completed in 1951 to accommodate an additional 180 students. Corbin Hall and its north addition underwent major renovations in the 1990s, which included improvements to the restrooms and living and study areas, plus the addition of computer and Internet hookups. Under the recent renovations, the 99,240-square-foot hall received a new HVAC system that includes individual temperature controls in each student bedroom and new mechanical, plumbing, electrical, data and fire protection systems throughout. KWK Architects also relocated the lounges on each floor to improve student interaction, improved accessibility features, renovated the laundry room, and added a multipurpose room and residential staff workspaces. Original fireplaces in three of the four central floor lounges were kept intact to maintain the hall’s historic character. The hall’s bathrooms were completely replaced and upgraded for accessibility throughout the building with a combination of private bathrooms and community bathrooms with private shower stalls. The shower stalls contain shower units placed inside high-walled privacy stalls with locks that have a visual “occupied” indicator. Each enclosed stall has a drying/dressing area outside the shower. The toilet enclosures are surrounded by the same high-walled privacy stalls as the showers. Another major improvement to the hall was renovation of the entry lobby. The existing entry lobby was dark and dated and created congestion, which did not allow for good security coverage and access control. The new lobby takes better advantage of existing windows, which provide more natural light and views to downtown Lawrence. Light-colored flooring and countertop materials as well as high-efficiency LED lighting were specified to brighten the space, and the new front desk was finished with wood to match the existing adjacent main lounge. The renovated design has 149 bedrooms, including a mix of single, double and triple rooms, and can accommodate 314 residents. High-efficiency LED lighting was used throughout the building and each bedroom has dual light switching to allow students to control the lighting levels at the front of the room at the closets and at the back of the room where beds and windows are located. This lighting configuration allows for students sharing a room to not disturb a sleeping roommate, plus allows for energy savings if the student chooses to use the natural light through the windows at the back of the room. Corbin Hall had a very dated kitchenette with old appliances that was replaced with a completely new kitchen. The renovation allowed the new kitchen to become more public and centralized between the two wings for the residents and their guests to use. It was also renovated with windows to the main corridor to provide a visual connection and has an improved layout that encourages socialization and community through an accessible center island as well as a round dining table option. Noll said one of the biggest challenges on the project was working within the complex historic construction of the hall’s south wing built in 1923. 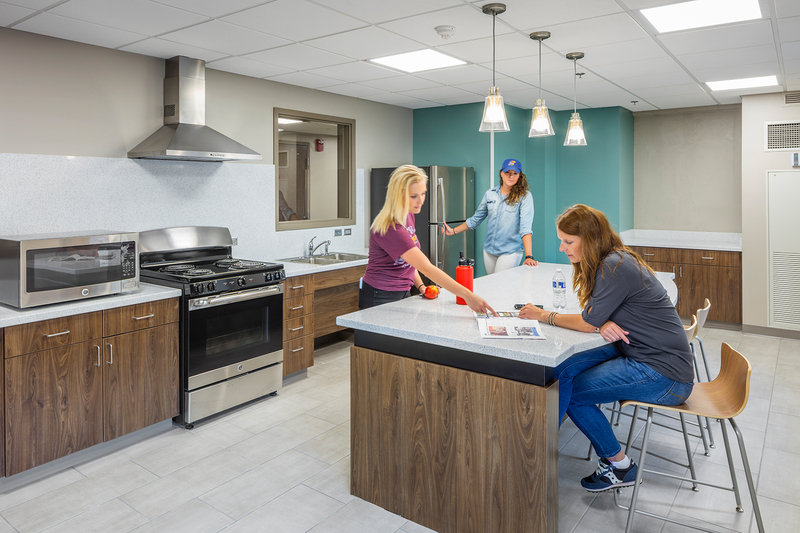 To add to the complexity, the central Residence Life offices located in Corbin Hall needed to be occupied, active and open to the students during the entire renovation. KWK discovered that the floor slabs under most of the bathrooms had years of water damage and needed to be repaired. Building an accurate BIM model of the existing building paid dividends to the design and engineering team as KWK worked though the design process. Founded in 2013 by five architects with a combined 150 years of higher education knowledge and experience, KWK Architects partners with colleges and universities across the United States to create innovative and inspiring places that enhance campus life. Areas of expertise include student housing and dining, and academic and science/technology spaces. KWK Architects has completed more than $1 billion in construction-valued projects since its founding and currently employs a growing staff of 15 at its headquarters in St. Louis, MO. For more information about KWK Architects, visit www.kwkarchitects.com or contact Director of Marketing Cindy Hausler at cindyh@kwkarchitects.com.